A compelling and fast moving book that unveils the real story behind Pope Paul VI and buttresses Our Lady's sensational Message of the impostor pope. How the Vatican bureaucracy used him to advance their own progressivist designs. Brings into focus the hidden plan to alter the liturgy before Pope Paul was elected and presents documented facts concerning the true origin of the modern Mass and how the pope actually fought against this. Exposes faces and profiles behind the untold plot to censor and forge the pope's mail and presents forensic evidence substantiating allegations that Paul VI was drugged while an impostor misrepresented him before the public. 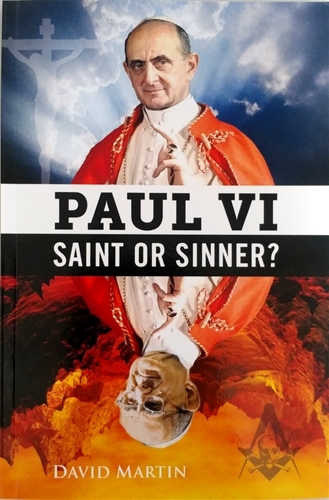 In addition, the book cites the many accomplishments of Paul VI, showing the extraordinary extent he went to in proselytizing the public before he was even elected. It also quotes his many speeches and letters and features a chapter on his encyclical letter "Humanae Vitae," held by many to be one of the great a spiritual milestones of Church history. In this manner it provides a timely meditation during the present crisis which he labored so assiduously to avert. Riveting! Hard Hitting! Bound to captivate!